Content creators will love the six cores of CPU power. So, does the Dell G7 15 have a cooling problem? Not necessarily. Yes, the G7 runs hot, but its CPU package temperatures do stay within Intel’s specifications. Also, Nvidia’s Max-Q spec is intended to cram as much GPU power as it can into the smallest possible space, meaning temperatures are bound to rise. I should also point out that the G7 15 ran somewhat cooler while playing less graphically demanding titles like Diablo 3 and World of Warcraft (a game that maps the 7, 8, and 9 keys to various spells and abilities). 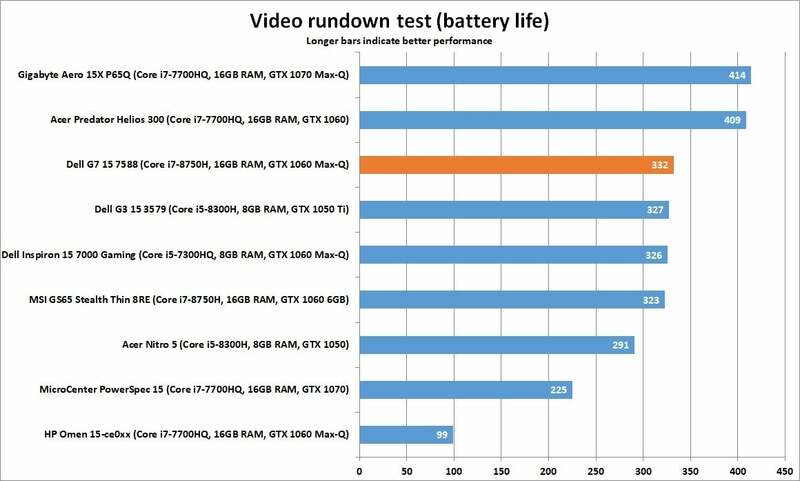 Still, the G7’s tendency to run hot is an unfortunate fact of life for gaming laptops as thin and light (relatively speaking, anyway) as this one. You can’t expect all-day battery life from a gaming laptop, but the Dell G7 15 and its 55-watt-hour battery do a reasonably good job of staying alive without help from the bulky AC adapter. We test battery life on a laptop by looping a 4K video using the stock Windows 10 Movies & TV app, with screen brightness set at about 250 nits (which, in the G7 15’s case, meant cranking the brightness all the way up) and volume dialed up to 50 percent, headphones plugged in. The Dell G7 15’s battery life is relatively solid given its 55 watt-hour battery. The Dell G7 15’s result of 332 minutes (about 5.5 hours) isn’t too shabby for a gaming laptop, landing in the middle of the pack with roughly the same battery life as the cheaper Dell G3 15, the older Dell Inspiron 15 7000 Gaming, and the svelte MSI GS65 Stealth Thin 8RE. Notably, the 5.5-pound Acer Predator Helios 300 squeezes more than an hour of additional life out of its slightly smaller 48 watt-hour battery, and that’s despite its full-fat GTX 1060 video card. The laptop in our roundup with the best battery life, the Gigabyte Aero 15X P65Q (which includes a power-hungry 4K display), boasts a massive 94 watt-hour battery. Armed with a screamingly fast six-core CPU and a fairly potent graphics card, the $1,200 Dell G7 15 packs an impressive amount of processing and gaming power into a shell that’s less than an inch thick. Gamers looking for the highest frame rates possible will find better value in a quad-core laptop with a beefier GPU, while those in search of a thinner and lighter hex-core gaming laptop should check out the pricey MSI GS65 Stealth Thin 8RE. But if you’re on a budget and want enough CPU power to stream or create videos while gaming, the G7 15 is an enticing, reasonably priced choice. Armed with a screamingly fast hex-core CPU and a reasonably robust graphics card, the Dell G7 15 packs an impressive amount of processing and gaming power into a shell that’s less than an inch thick.